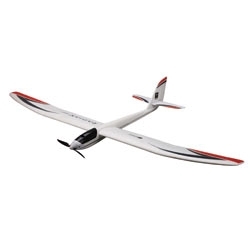 Designed with experienced sailplane pilots in mind, the Radian® Pro aircraft comes out of the box with ailerons and functioning flaps that let you take advantage of sailplane mixing functions like reflex, camber and crow. But you don’t have to have a programmable system to fly it. Anyone with a 5-channel sport radio can enjoy basic 4-channel control with flaps using the included Y-harness. Like the original Radian, the Radian Pro also comes equipped with a powerful 480-size 960Kv brushless motor system that can catapult it to altitude in seconds. Its airframe is constructed from the same tough Z-Foam™ material and has been reinforced with fiberglass blades in the fuselage and wing to reduce flex. This reinforcement, along with that of the carbon fiber rod in the wing, make it possible for you to achieve a level of soaring precision with the Radian Pro that’s on par with many competition gliders. Best of all, you can have this Bind-N-Fly® version flying in the time it takes you to charge the included battery pack and bind its Spektrum™ AR600 receiver to your full-range DSM2®/DSMX® aircraft system (sold separately). To take full advantage of the capabilities of the Radian Pro, a programmable radio system with sailplane mixing functions is recommended.